When I first started climbing, the local climbing gym offered some clinics from the "pros." As an over psyched youngster, I was always game to take each and every one of them, I figured the more I learned the better I would become. At that time, I was pretty much a gym rat and competition climber, due to my lack of transportation. I would go outside if one of the guys that worked at the gym would drag me along, but I wasn't a seasoned granite pro. So, when a crack climbing clinic from THE Peter Croft opened up, I jumped on it. I know that I would never use the techniques that he told us in my next comp, but I was always hopeful one day I could put them to use. Add onto that the fact that he is an incredible climber and super person, and it was a no brainer. To this day each time I get a jam, I can hear in the back of my head Peter's voice, "Thumbs up is always better." It's actually made me switch my jam on many occasions. A few years later he was kind enough to drag me up the iconic Joshua Tree route "Figures On A Landscape" as I bumbled my way through learning how to mulit pitch climb. When I asked him if he would be so kind as to do an interview with me, he agreed as long as I answered his questions as well :-) So, below is a two for one special! Hope you enjoy hearing from one of my long time climbing heroes! Beth: Can you tell me how you started climbing? I never wanted to climb. I'd seen stuff in movies and magazines and it looked out of my league, totally alien. But then a friend urged me to read a book by Chris Bonington called I Chose to Climb. After the last page I knew I had to try it and after my first climb I knew I had found my thing. Peter: Your turn - How did you start and was it love at first climb? My dad had taken me on a few pitches in the Sierras when I was really young, but it wasn't until he took me to the local climbing gym that I fell in love. The fact that I could do the activity on my own, just bike down to the gym and climb whenever I wanted really opened the door for me. Beth: How did you decide to make your home in Bishop? After growing up and learning to climb in the rainy northwest (BC) Yosemite and sunny California became the goal. Once I found Bishop and the east side of the Sierra with my wife Karine, however, it fleshed out my world from valley bottom to mountain top - and I'm still close to Yosemite. I still visit Canada but Bishop is home. Peter: How about you: where Â do you consider home and what climbing area holds your heart? Hmmm, good question. I consider Yosemite my home. Whenever I return from traveling or spending time in the bay area, it just feels like medicine for my soul, so I figure that's a good place to put down roots. And it just so happens to be my favorite climbing area as well - a bonus! However, it can be quite isolating in the winter and teaming with tourists in the summer, which gives good time to travel. Beth: What are some of your most memorable ascents and why? I'd say one of my favorite ascents was climbing the Nose and Half Dome in a day with John Bachar. Linking those two was great (and really opened my eyes to what else might be possible) but sharing the adventure with my hero blew me away. We finished up climbing through a thunderstorm on Half Dome and summited to a double rainbow. At that moment it felt like the universe was made just for us. Peter: So what are some of yours and what do you feel is the real you - the one pitch cragger or long router? I think I'm both! And I need to add in there bouldering (although I'm pretty terrible at it) and a gym rat. I really love climbing on my home wall, something about it really suits me. And I love bouldering because it is so freaking hard for me! As far as some of my most memorable, I'd definitely have to rank my first time up the Nose with Hans Florine when I was 18 or something. I vowed I would never touch El Cap again because I felt like it was too hard for me! :) Shows you how good my short term memory is! And I'd probably have to put in Meltdown in Yosemite, purely because it took me so much effort and determination. I wanted to give up so many times over the 4 or 5 months I worked on it. I'm glad that it had a happy ending! Beth: If you could go climbing anywhere (whether you've been there before or not) where would it be and why? The unknown has that mystical attraction but, Boy, I'd love to go back to the Charakusa valley in Pakistan. It's like Yosemite walls topped by ice faces with needle sharp summits. Most crazy beautiful mountains I've been to. Peter: Where is you dream area? Ever since being kidnapped in Kyrgyzstan, those far off places have totally lost their appeal. It's funny to look back when I was a teenager, before Kyrgyzstan, a whole host of areas topped my list, but now my list is somewhat tame and boring. I truly love Norway, and can't wait to get back there. As well as South Africa. I've never been to Australia or New Zealand, so those are on my list as well. We'll see how traveling with a little one goes and how mobile we actually will be! Beth: Tell me a little about your history with Yosemite? How and when did you start climbing there? What was the scene like then? What was a "typical" Valley day for you? My first day climbing in Yosemite was right after a spring storm and one pitch cragging at the base of El Cap seemed just ticket. Never mind the top half of the wall was cased in ice - hell, it was a nice sunny day. In no time, however, huge sheets cartwheeled off the cliff like window panes along with chunks the size of oranges and canaloupes. We all got hit but we thought that was just what you had to put up with if you were going to the Valley. Typical Valley day? Climb until dark, then throw down my bag in Camp 4, get up before dawn (and the ranger patrol) and climb again. That saying about the early bird getting the worm - well, it also gets you a free campsite in Yosemite. 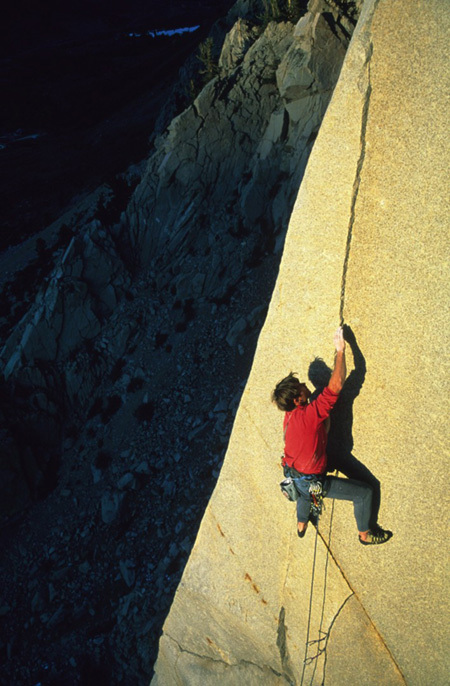 Beth: If you've seen Valley Uprising, what was your impression having climbed during the Stone Master time? No I haven't seen Valley Uprising but on a flight to Europe last week I saw Man of Steel - the latest Superman and the best, by far. Peter: And you, what's your take on the Stonemasters - dirty hippies or rock stars? Heroes or messed up misfits? Ha! I definitely think they were pretty visionary taking hard free climbing to Yosemite. I still go back and try to repeat Bachar and Kauk routes and am in awe that they were established so long ago! Beth: You are one of the most inspiring climbers out there (in my humble opinion), what are your thoughts on the climbers of today? Are you inspired by anyone/anything in particular? Of course I'm impressed by a lot of climbers and climbing today. Chris Sharma, in particular, has such an incredible body of work - the way he's reinvented himself and climbing. That he's also such a good guy makes him inspirational all the way around. For women you're the one I admire the most (and no, I'm not just sucking up). There's the ideal in climbing that's very rare in top performers: the Climbers' Climber - she's the one who is in it for the pure love of it. No blowing smoke, no tooting your own horn - just getting after it for all the right reasons. Some years ago I saw a climbing mag with most of a page describing someone projecting Cosmic Debris over the course of a week. Same issue, I think, I saw a single line mentioning you on sighting the Phoenix. Same grade - different story. I'm not trying to make you out as some moral authority but you are someone I point out as the real deal. Peter: You? What are the key ingredients you hold most important in climbing and climbers? I'm definitely completely turned off by ego. There are so many strong climbers out there, but a lot of them come with an ego, which doesn't inspire me in the least bit. I'm inspired by the climber who is out there because they love climbing for climbing, not for any other reason. Climbers that have always topped my list: You (yup, it's true, I totally had the poster of you soloing the Rostrum hanging in my room growing up! ), Lynn (the fact that she was so ahead of her time in her ascents, really opened my eyes to what could be done as a woman). Tommy (he was so instrumental in my climbing, and has the psyched and work ethic that most people dream about.) As far as younger women climbers I really am impressed by Hazel Findlay and Emily Harrington. They're both ladies who are out there because they love it. Alex Honnold, psyched and inspiring. Beth: What are some of your passions outside of climbing? Passions outside of climbing? For starters climbing to me means everything from bouldering to big peaks - well maybe not dealing with haul bags and slow aid climbing. Watching movies and writing are two things I've always loved. I can just lose myself in either one. Peter: So, Beth, you're a mom now and you've got brand new responsibilities. Have you got a plan on how to balance being Mom and your connection to the outdoors, to climbing? And speaking of movies, what is your latest favorite? And do you think, like I do, that the first Thor movie was superior to the second? As well, have you heard that in the next one they're going to make Thor a woman? I like to think that I'm enlightened but I don't think I'll be able to handle that. Yes! Definitely trying to figure out the balance of being a mom to Theo and still getting out and doing what I love. As well as trying to show him all the things I love about the mountains and climbing. If he takes to it, great. If not, then hopefully he can find a passion of his own. I really love cooking, it occupies majority of my time outside of hanging with Theo and climbing. I've really gotten into good food and using good ingredients. Funny how people can be so passionate about things! I also really love writing, but find it a tremendous challenge, which is good for me. Although I'm finding that it's hard to find the time to write now with the little man around. Beth: What are your favorite pieces of Metolius gear? My favorite gear is probably my Safe Tech Trad harness. Very comfy, really like having the two low profile belay loops and the bomber gear loops. Favorite harness ever.